Seared Tuna Sushi Bowl | Food E.
← Oh… hello. It’s you again. This is a super healthy, easy peasy meal that comes together in 20 minutes and will satisfy your sushi craving without all those fancy sushi kits and chopsticks. Try and avoid purchasing bluefin tuna! It’s overfished and is considered endangered. Put the rice in a saucepan with 1 cup of water and a generous pinch of salt. Bring to a boil, then reduce heat to a simmer and cover. Cook until the rice is tender and all of the liquid is absorbed, about 10 – 15 minutes. While the rice cooks, put a large non-stick skillet over medium-high heat. Rub the tuna all over with the oil and sprinkle with salt. When the pan is very hot, add the tuna and sear on each side (including the edges) for around 3 minutes per side. The fish will be raw in the middle. Transfer meat to a cutting board and let it rest for at least 4 minutes before thinly slicing. 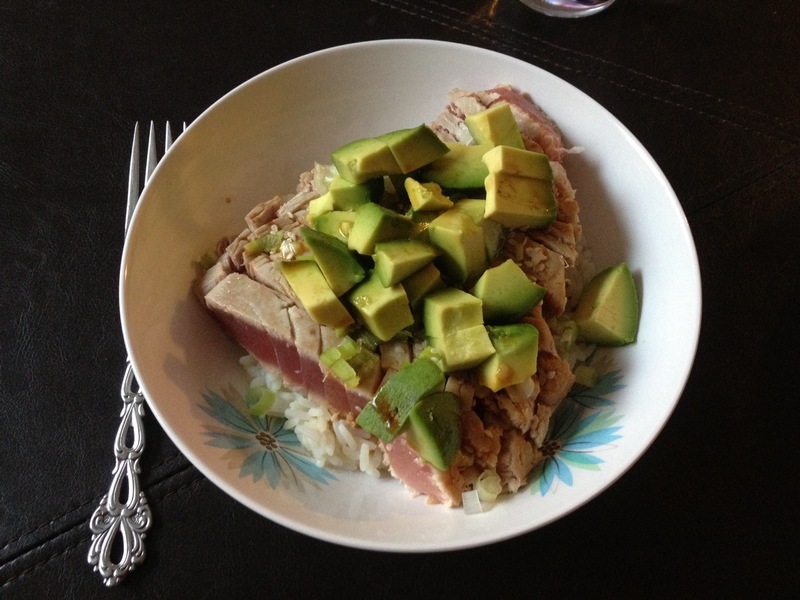 Once the rice is cooked, divide it between 2 bowls and top with tuna. Sprinkle with cucumber, avocado, scallions, and nori. Add soy sauce and sesame seeds and serve. I HAVE to try this. Thanks for sharing!